Kellogg Community College invites the community to participate in the care and maintenance of a new community garden located on the College’s North Avenue campus in Battle Creek. Click here for information about work days for KCC’s new community garden. 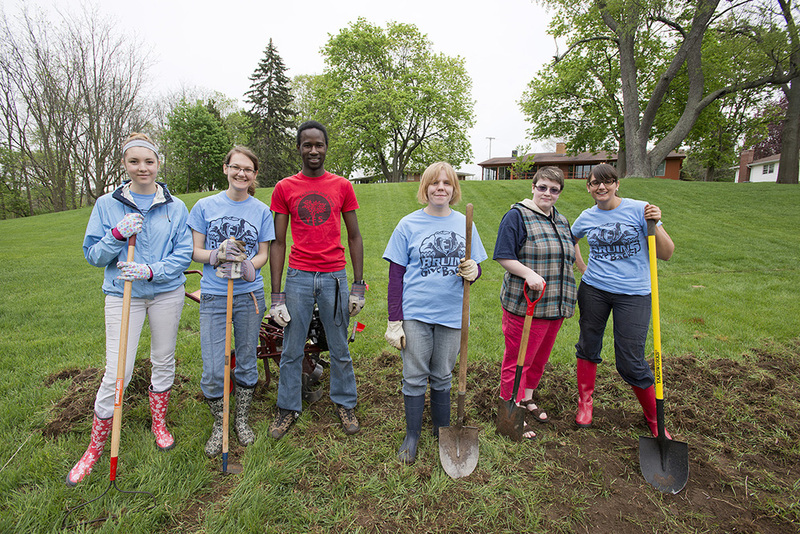 KCC students and employees together broke ground for the garden, which is located behind the Morris Learning Resource Center at the school, 450 North Ave., on May 14. The plot consists of six 4- by 8-foot raised beds, each 1-foot deep, which will be planted with a variety of vegetables for donation after harvest. The project is spearheaded by exchange student Joseph Marah, of Sierra Leone, who received a $3,000 grant from the Kennedy-Lugar Youth Exchange and Study (YES) program to develop a community project with an environmental focus in his community. Kate DeGraaf, service-learning manager at KCC and an advisor overseeing the student project, said the garden offers more opportunities for members of the KCC community to give back without leaving campus. DeGraaf hopes to see the garden become a self-sustaining, long-term project that continually brings the campus together to work toward a common goal. Art students could decorate bricks for the landscaping, for example, or business students could sell seeds to buy tools. “It’s a great way for a variety of classes to get connected to service-learning in some form,” she said. For more information about KCC’s new community garden, contact Service-Learning Manager Kate DeGraaf at 269-965-3931 ext. 2211 or degraafk@kellogg.edu. KCC baseball signs Justin Gierlowski of North Liberty, Ind.